When the Lexus hybrid executive sedan was first introduced at the New York International Auto Show in 2006, the world’s first full hybrid V8 powertrain was embodied in the 2008 LS 460h. Though the Lexus LS flagship model line is now in its fifth generation, the hybrid variant marks only its second generation in the 2013 Lexus LS 600h. Nevertheless, this lengthened version of the premium hybrid has benefited from the evolution of its predecessors. The new Lexus LS models exhibit, “…An exciting new design direction, a renewed focus on driving dynamics and a host of accolades,” said Brian Smith, Vice President of Marketing for the brand. Those independent tributes include holding the top spot in JD Power’s Initial Quality Survey, Vehicle Dependability Survey, Customer Satisfaction Index and Sales Satisfaction Index. In short, the Lexus of today is a better value than it has ever been. The incorporation of the spindle grill and other design features of the line are giving the Lexus lineup a distinct and instantly recognizable image. While incorporating many of the aspects of the 2013 Lexus GS 350 and keeping within the DNA of the brand, the hybrid flagship manages to retain a degree of individuality and sophistication befitting its status in the line. The spindle grille is completely framed in chrome to create a bold, dynamic statement worthy of a flagship model. The edges of the radiator grille and bumper have been lowered and visually imply a lower center of gravity and increased stability. Prominent fenders sweep around the wheels, embracing the hood and spindle grille. The tautly stretched hood with its striking center bulge, coupled with the grille and air intakes below the fenders, combine to give the 2013 Lexus LS 600h a powerful and resolute, though thoroughly modern countenance. The rocker panels and door moldings create an integrated linear flow connecting the fenders and unifying the entire exterior design. The spindle grille is to some extent replicated by the rear deck, by the shape of the tail lamps and the sharply bending pillars of the trunk. The look of the 2013 Lexus LS 600h is further distinguished by standard all LED lighting in a 3-lamp configuration, including two LED low-beam units and another LED high beam. Even the turn indicators use 12 LED lights that fade from sight when not active maintaining a crisp, clean appearance. Additional LED turn indicators have been added to the sideview mirrors as well. LED fog lamps match the headlamps and use 70 percent less power than traditional fog lamps. The rear lights have all been redesigned to accommodate the use of LEDs as tail lamps, stop lamps, rear turn signal lamps and backup lamps. Inside the 2013 Lexus LS 600h is spacious and sophisticated befitting its flagship status. The all-new cabin has been divided into zones so that data displays and other controls are arranged for ease of operation without a significant change in posture or line of sight. The interior surfaces are wrapped in beautifully stretched leather and artfully shaped metal, accented with the warmth of polished wood including the new Shimamoku wood that goes through 64 processes in 35 days to create a beautiful and exotic wood grain. This wood has its first introduction in the US market on the new LS models. Color patterns are formed through a lamination process, which darkens the deeper wood grains while turning whiter the lighter veins. Agathis wood is cut very thinly and hand-finished for hours, taking half again as long to produce as other wood-based auto trim. Agathis is commonly used in the creation of wooden instruments like guitars. It adds a subtle look of exotic sophistication to the interior accents, clearly enunciating the luxury and exclusivity of the luxury hybrid vehicle. Other choices of interior trim finishes include Walnut, Matte finish Ashburl and Bamboo. The center cluster panel has been simplified and made more compact, with climate controls placed for ease of use and audio controls distinguished by polished aluminum knobs. Separating the audio controls and display creates a thinner instrument panel requiring reduced eye movement to view settings. The use of LEDs continues even to the air conditioner that uses a high-contrast, 16-gradation full-dot organic light-emitting diode display. The interior lighting is another example of the sophistication and refinement of the 2013 Lexus LS 600h. The Advanced Illumination System coordinates the timing and brightness of both interior and exterior lighting. The LS 600h even uses different hues and frequencies of light for specific purposes. Champagne White lighting (4,000–5,000K) instills peace of mind and reveals the advanced nature of the hybrid. It is only used to illuminate areas below the occupants’ shoulder. Dome lamps and vanity lamps lighting the face use Warm White light (2,700–3,000K), as does all overhead lighting. Gauges radiate White Heat lighting (6,800–8,800K) on all meters, switches and the clock. The entire 2013 Lexus LS line comes with Blind Spot Monitor (BSM) and Rear Cross-Traffic Alert (RCTA) standard, using quasi-millimeter wave radar in left and right rear quarters to detect vehicles. BSM uses radar to detect vehicles in your blind spots illuminating an indicator within the sideview mirror whenever a vehicle is present in the blind spot zone. It is functional at speeds of 10 mph and higher. RCTA warns the driver if a vehicle is coming when backing out from a driveway or parking space, when in reverse at a speed of 5 mph or less. To be detected the vehicles must be larger than a small motorcycle and traveling between 5 and 18 mph. The Advanced Pre-Collision System that has been a part of Lexus safety for many years has been updated with A-PCS night detection, enhancing the system's ability to detect moving or stationary pedestrians at a much greater range of speeds – down to 3 mph. If the vehicle is approaching an obstacle and a collision is predicted, the system will alert the driver if the difference in speed is less than 25 mph. If the rate of closing between the two objects exceeds 25 mph or the driver fails to respond to the alert, the car will intervene and apply the brakes automatically. This will both get the drivers attention and ameliorate the impact should one occur. This is one of the baby steps that will lead to the acceptance of autonomous cars. The system actually monitors where the driver is looking with two built-in near infrared LEDs and a CCD camera. If it notices the driver not watching the road and an imminent collision it will intervene briefly in the name of safety. By sheer chance, we actually experienced the intervention of the Pre-Collision system as we approached a bicyclist on a curve. When the two=wheeler was directly in front of the Lexus and about 25 feet away, it dramatically slowed the car to insure we didn't collide. We did not slow as we simply had to swerve around him as we rounded the curve. Most people would be delighted the system is capable of correcting human error when and if it should occur. It was not a slap in the face, but a brief measured intervention. Seldom are drivers as in control of their immediate environment as when they take the drivers seat in the 2013 Lexus LS 600h. The seat is power adjustable in 16 ways, including four lumbar inputs, and has been redesigned to provide proper posture and pelvic support. At start-up, the hybrid makes little noise, of course, but that quiet ambiance continues even as you engage the 389 horsepower of the 2UR-FSE high-output 5.0-liter, 4-valve DOHC V8. Coupled with the pair of electric motors, you have 438 horses at your beck and call, with five driving modes at your disposal in the silence of a college library. This unprecedented level of interior quietness is the result of new engineering and aerodynamics. The grille has added artifices that insure air flows properly through it, while the wheels contain new air channels that reduce the transfer of noise from the road. The drive modes include Eco, Normal, Comfort, Sport S and Sport S+. 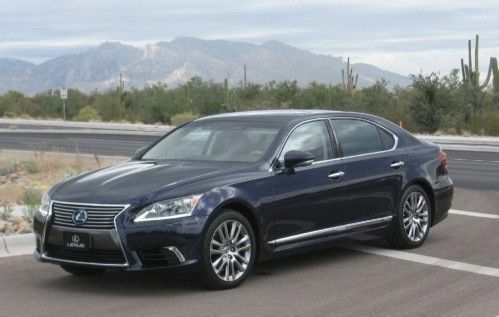 The 2013 Lexus LS 600h drives the way most hybrid buyers would want it to in Eco mode, staid and easy-going. The Normal setting is something of a misnomer in that normal for the Lexus LS is not normal for other vehicles in the least. In Comfort mode the ride is so smooth and quiet, anyone in the back seat could easily drift into sleep. In the Sport S or Sport S+ mode the staid flagship grows a pair, showing that’s it’s just as comfortable running with the big dogs as it is at the Concours d’Elegance. “The Sport Plus mode is an alter-ego for the LS,” stated Bill Camp, Dealer Education Administrator for Lexus College, during the recent technical presentation in Tucson. He was not kidding. Our test drive took us through nearby Saguaro National Park, where the roads are not only winding, but comprised of numerous rolling hills as well. The 2013 Lexus LS 600h handled this roadway roller coaster like a champ in Sports Plus mode. Even so, the ride remained smooth and comfortable through winding roads and undulating hillsides and at speeds most Lexus owners wouldn’t consider on such terrain. If you want a powerful luxury sports sedan to drive, you should look at the IS or GS F-Sport models, unless you want a flagship that can pretend to be a sports sedan now and then. In that case, the 2013 Lexus LS F-Sport is just what you want. Those who want a true Lexus flagship, and perhaps would rather be chauffeured about, should have a look at the 2013 Lexus LS 600h. It combines status, sophistication and comfort with technology, performance and a bit of green cachet. Add to that all the optional rear seat amenities like a reclining right seat with Shiatsu massage, plus independent heating and cooling, along with many other executive niceties and you have a vehicle custom made for the “Progressive Leaders” it was designed to suit.